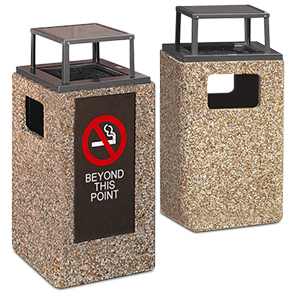 This 20 gallon trash receptacle is constructed with super strong epoxy and natural stone aggregate that makes it comparable to reinforced concrete but at considerably lower weight making it easier to handle and less expensive to ship. It comes with solid rubber feet to protect surface areas and a reusable rigid plastic liner. Options include your choice of 4 distinct graphic no smoking panel inserts. Please indicate panel number when ordering.